It is finally time for "The Big Game"! 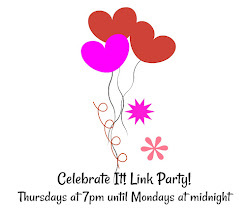 Friends will be dropping by to eat and drink all kinds of yummy theme foods and cocktails, watch commercials that are funny and produced for this very day, wear team themed shirts, and fun hats and have a great time! 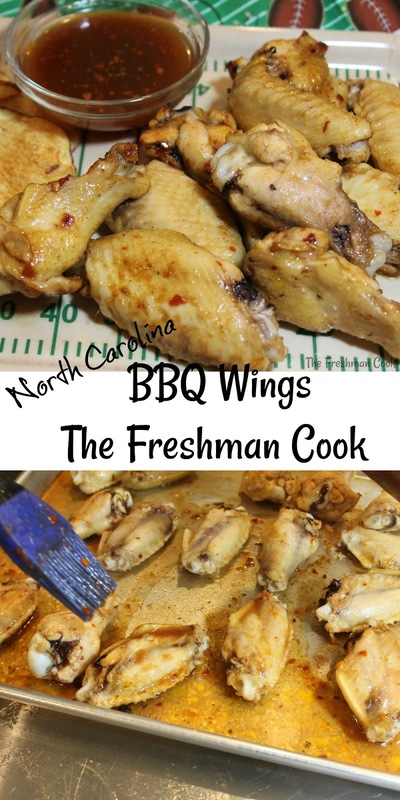 Make these North Carolina BBQ Wings part of your menu and fun! 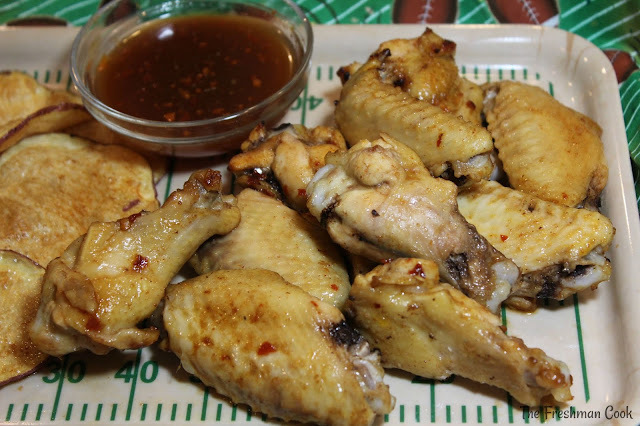 The sauce can be made a day or two ahead of time, so on game day, all you need to do is bake the wings! Simple and delicious! 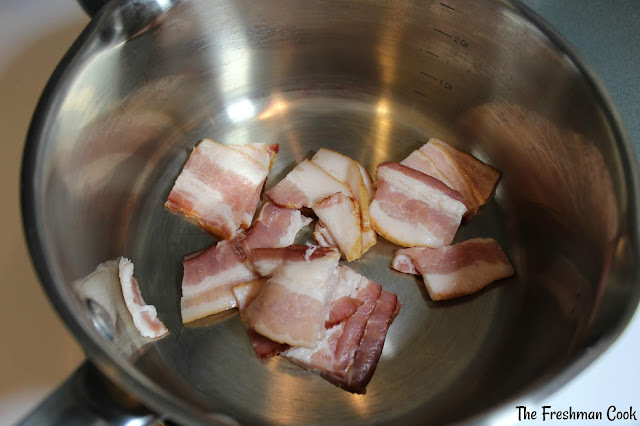 Cut each slice of bacon into 4 chunks and place in a medium sauce pan. Add the beef stock, both vinegar's, sugar, ketchup, red pepper flakes, chipotle chile pepper and salt. Bring the mix to a boil, then reduce to medium low heat. Simmer approx 15 minutes until the bacon renders its fat. Remove from heat and set aside for approx. 20 minutes to allow flavors to develop. Remove bacon from sauce and throw bacon away. 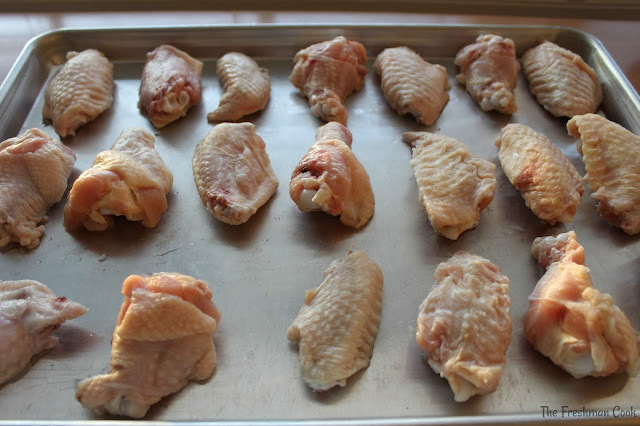 While you are waiting for the sauce to finish up, place the wings on a baking sheet. Preheat oven to 375 degrees. Use a brush to spread sauce on each of the wings. Bake for 20-25 minutes. 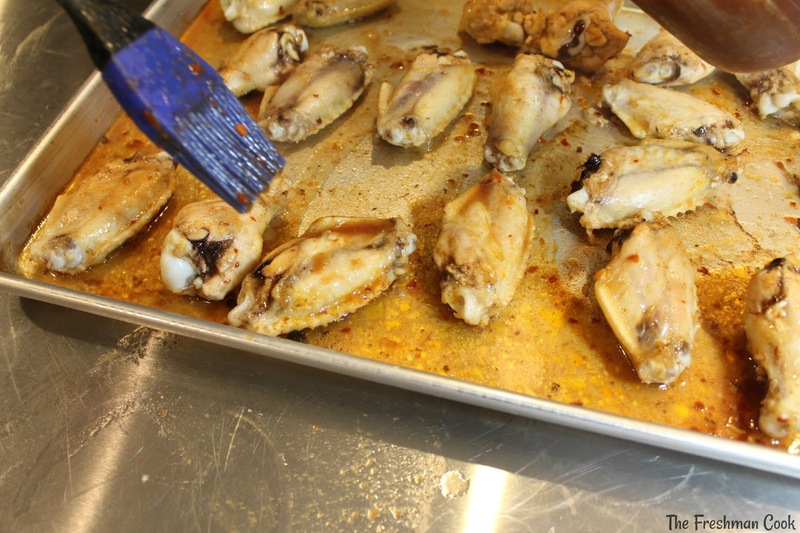 Remove tray of wings from oven and spread another layer of sauce on wings. Return to oven and bake for another 20-25 minutes. Check the wings in a meaty part of the chicken, to make sure they are fully cooked to a minimum internal temperature of 165 degrees. Also, be aware that the size of your wings may be smaller or larger than the ones I used here, so adjust your time accordingly. 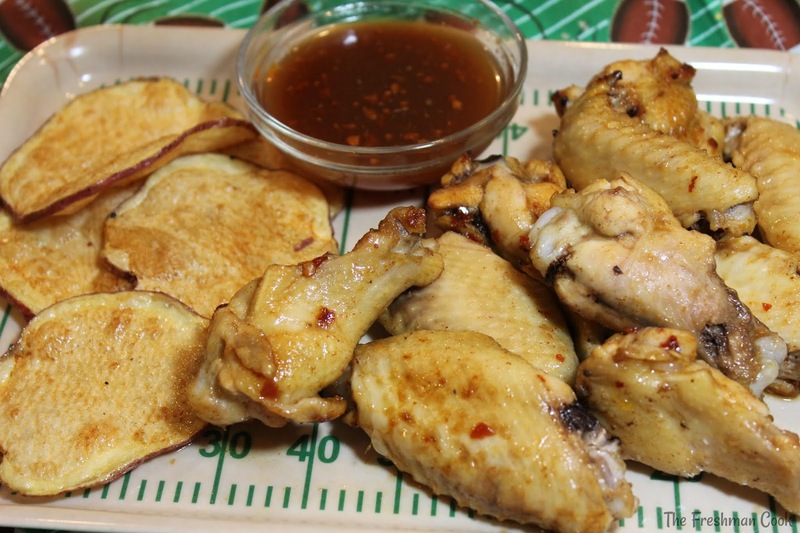 Enjoy your wings with a side of homemade chips, and a side of BBQ sauce for dipping! Preheat oven to 375 degrees. 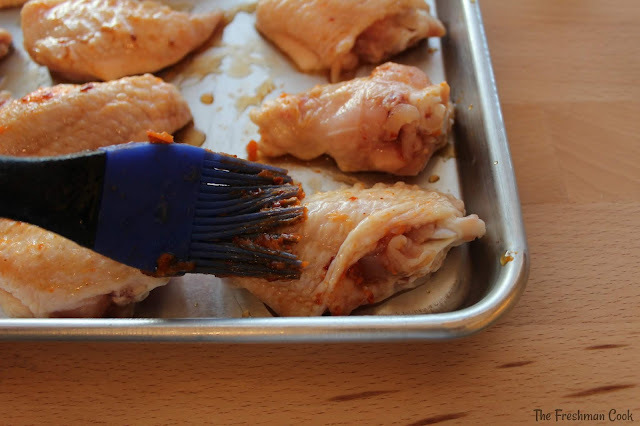 Use a brush to spread sauce on each of the wings. I've never made wings at home - this makes it look so easy! We love making wings at home and we also love NC BBQ! 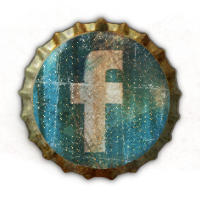 These will be perfect for watching the gam. A little sweet and a little heat in that sauce, sounds fantastic! It's not a party without wings. This sauce sounds amazing. Bacon on wings!? YES. Gotta have wings for the game. These sound delicious. I totally love wings and have some in the freezer in need of a recipe! Wings are one of my favorite thing! This sounds amazing and perfect for game day! Big cheers for these being baked! Not quite so messy to make...just messy to eat like they should be! I love wings! These flavors are perfect for game day! These wings look so tasty and the sauce sounds so flavorful! 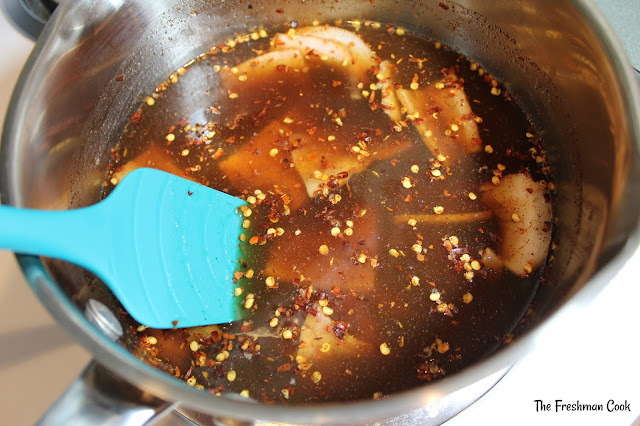 The combo of beef stock and bacon is sure to pack a nice savory punch! Carolina bbq is my absolute favorite! It's not too sweet and has just the right amount of tang and heat! 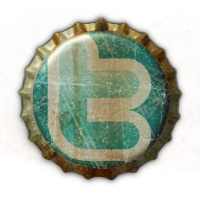 Follow The Freshman Cook's board The Freshman Cook on Pinterest. "Cooking is like love, it should be entered into with abandon or not at all"